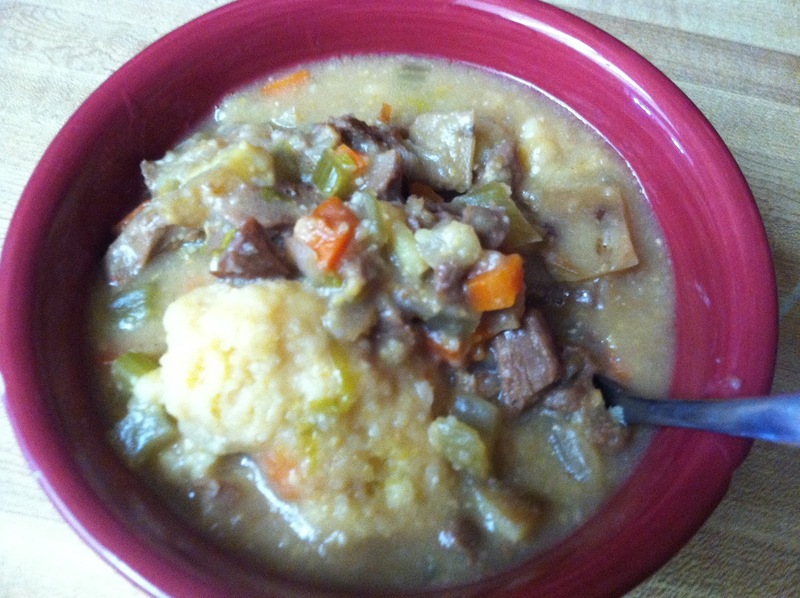 The Bad Kitty Bakery: Seitan Dumpling Stew with RECIPE! Food does not have to be pretty to taste damn good. This was never more true of the simple but delicious stew that I made yesterday. It is one of those things that you look at in the pot and raise an eyebrow, but after one taste Jason proclaimed it was the best that he ever tasted. The best part was it was super simple! I love things that taste great and are simple to make. So here it is, my Seitan Dumpling Stew. All my fellow Hobbits (and everyone else) enjoy!! Dice the onion, celery, carrots and seitan. Add to a pot over medium heat and cook until the onions are translucent. Dice and add the sweet potato and water. Turn heat to medium high and cover, waiting for it to boil. In a clean bowl, combine the cornmeal, flour, salt and baking soda. Add the milk to this mixture. Once the soup is boiling, add the cornmeal dumplings by teaspoon fulls. Cover pot, reduce heat back to medium and boil for 20 minutes.